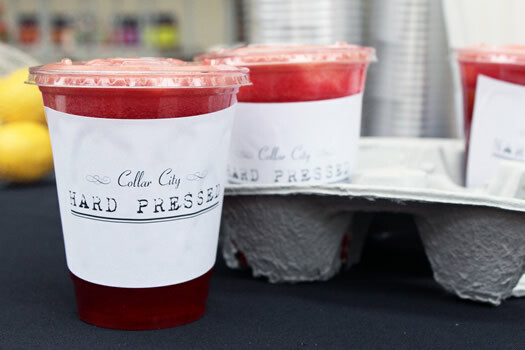 On this particular Saturday, Collar City Hard Pressed was serving up three different kinds of juice. I tried two of them: "Go for the Green" and "We Got the Beet." The Go For the Green is made with celery, romaine, cucumber, apple, lemon and spinach. It tastes, in a word, healthy. You can definitely tell it is packed with veggies, but it still has a pleasant and drinkable flavor. My co-taster said it was like souped-up apple juice. We Got The Beet includes beet, apple, lemon, and ginger. It had a sweet taste, with tangy hints from the ginger. It's my favorite selection so far. In both recipes you can taste all of the flavors, but the ingredients work well together. Until you get to the very end, the juice has a smooth consistency. Why did you start Collar City Hard Pressed? It's funny because it wasn't something that I thought about for very long or particularly carefully. I found myself basically obsessed with fresh juice and smoothies and was suddenly annoyed that there wasn't a place in my neighborhood where I could get any. I kind of hate leaving my neighborhood on the weekend so just thought it was only fair that we had a juice place here downtown. I also recognized that juicing was a pretty trendy business and thought downtown Troy would be a great place to get to work. 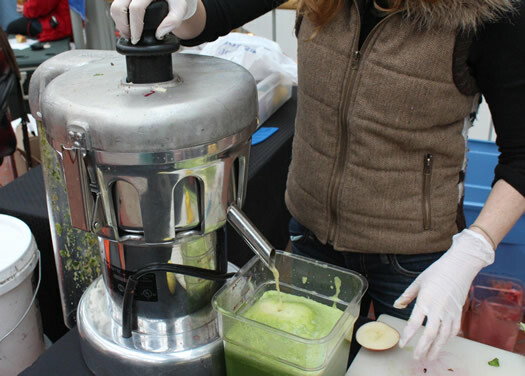 What do you do with all of the juicing waste? All pulp goes to one my fellow vendors at the farmers market, Mariaville Farms from Delanson. They use the pulp to feed some of their animals. I rarely have produce left over, but if I do, I pass it along to other people at the market who could use it. Troy Compost is also at the market and they helped me out a couple times before Mariaville and I connected. 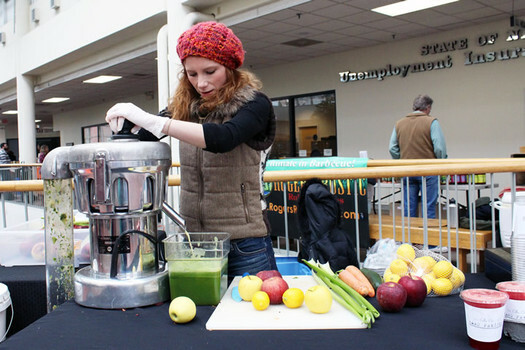 Personally, what's your perspective on the whole juicing movement? Food is all about balance to me. Anytime people become obsessed with ONE food and look at it as a miracle or cure all... I think that's a little nuts. I'm a fan of the juicing movement; meaning juice should be available and incorporated into a healthy balanced diet. Having fresh juice should be an option. I'm not a fan of anything restrictive or that requires you to give up solid food for several days while you exist on some kind of lemon juice cocktail. If there is someone out there that felt great after doing this, more power to them, but I it's not something I could consciously promote or convince people to do. It just seems like a bad idea to me and personally, I would be extremely unhappy and not nice. Sometimes people ask me about what I eat, or how I eat, and I always go back to the Michael Pollan quote which is old and clichÃ© by now, but always seemed to be the easiest answer to a complicated question: "Eat (real) food... not too much... mostly plants." And not one of them, eat all of them, the good ones. What are your future plans for CCHP? To not drop apples onto my first floor neighbors at the market. To start offering bigger to-go containers (people have started bringing small buckets and Tupperware bowls so I figured it's time). And I have some exciting things in the works with other local businesses. I'm mostly planning for the summer market, which I am really looking forward to. Do you have any plans of opening a retail location? This interviewed has been edited. Yummy! Where does the produce come from? What are the prices for the juice? J- It's $5 per juice (in the size containers pictured). Jessica told me where her produce was from, but I can't remember for sure right now. I had the beet juice recently, really good, sweet, tart, and you could taste everything (lemon and ginger worked really well with the beet). $5 I think! Love me some of Jess' fresh juice on a Saturday morning! The beet juice convinced me that I was wrong all this time and that, in fact, I actually DO like beets! Probably just in Jessica's amazing juice blend, but if it gets me to imbibe this well-known "beauty" food and all-around great nutrional player then I'm down! In a word: DELICIOUS!